I sprout on a regular basis, both nuts and seeds and keepo in the refrigirator. Sprouting is amazing! its easy and it taste great and its very healthy! You can sprouts nuts, seeds, beans etc and it makes your food even more nutritious and healthy. Why soak? neutralises the enzyme inhibitors present in dry grains, seeds and legumes, and starts the production of numerous beneficial enzymes. As they soak, the enzymesand other helpful organisms break down and neutralise the phytic acid. As little as seven hours soaking in water removes most of the phytic acid. Soaking, fermenting and sprouting also breaks down gluten and other difficult-to-digest proteins into simpler components that are more easily absorbed. At the moment I am sprouting alfa alfa seeds in my kitchen and its really easy! Just take 2 tablespoons of alfa alfa seeds and soak them for 10-12 hours or overnight in a jar. Then rinse out the water and rinse 2-3 times a day for about 3-5 days. Let them stay covered but in daylight. - A rich source of antioxidants and alkalizing to the body. Both of these effects are essential for protecting against disease and strengthening the immune system. - A good source of essential fatty acids, which many diets are lacking in. - An excellent source of fiber. - Filled with an array of essential minerals. 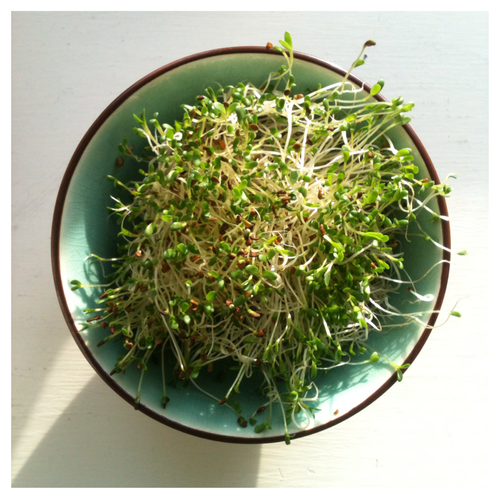 (During sprouting, the minerals develop into a chelated form, making them easier for the body to utilize). - A good source of protein. Rinsing: Water is the key ingredient in sprouts. Use it often.